Come to class in whatever makes you comfortable, but try not to wear anything too loose or baggy. We recommend to wear workout attire that is form-fitting. 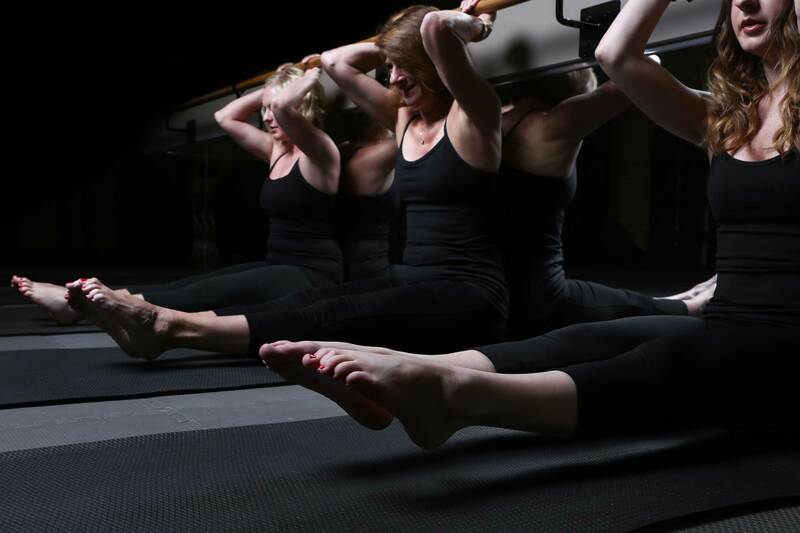 Barre is form-focused and we watch closely to make sure alignment and posture are maintained. We recommend non-skid socks, but do allow you to participate barefoot in barre. Please bring socks for cycling classes. Nothing! We provide all of the equipment. Water is recommended especially for spin. We also recommend a towel for those who may sweat a lot. This may reduce stability when hands are on the mat. If you‘ve never taken a barre based class before (or even if you have), you may find that you‘re working out muscles you‘ve never felt before. Shaking is encouraged! Arrive 15 minutes before your first class so that we can show you around and get you prepared. I have an injury or physical limitation, should I be concerned? Injuries and limitations are always a concern whether they are old or more recent. Be sure to fill that information out on your profile when you arrive so we can update your records. Please let your teacher know prior to class. If your injury required surgery, or if we deem necessary, we may require a release from your doctor. I am overweight and feel intimidated. You aren’t alone! Our studio celebrates all body types and commends everyone for their own personal fitness journey. No matter your shape or size, our teachers are committed to helping elevate you to a new level of health and wellness. How many times do I need to come to class a week to get the best results? For the best results attending 3-4 classes per week is optimal. We also recommend taking 24 hours in between each class as well to allow muscles to recover. If you are a new client and class had begun you will not be permitted in class. This rule is for your safety. If you have attended a few classes and are a few minutes late we recommend doing 60 knee lifts to warm up the muscles prior following along with the rest of class. This prevents injury and we want everyone to workout safely! For all of our indoor cycling classes we do lock the doors once class has started, if you are late you will not be permitted in. Additionally, all clients new to cycling MUST arrive 15 minutes early for their first class to allow time for them to be set up on their bike before class as this is imperative to a comfortable, safe, and, effective ride. Do I need to reserve a spot for every class? Yes, we ask that you reserve a spot online, this allows for you to have space at the barre or bike. We have limited space and want ensure that our classes are not overcrowded for your enjoyment and safety. Our teachers customize their classes based on who will be attending. If the class should be full, you will be put on the waiting list. Should you decide to add yourself to the wait list, please plan to attend. You will be notified up to four hours in advance. Depending on what package you have, if you are a no-show you will be charged $10 or lose the class. CLICK HERE to sign up online for classes.